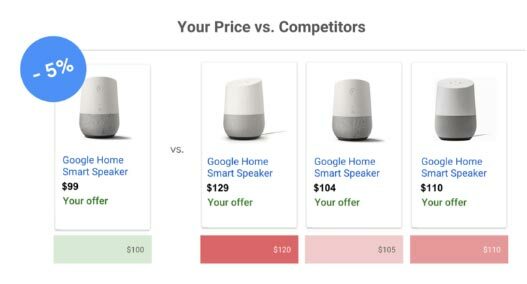 Google Shopping advertisers will soon be able to view the price at which their competitors sell a product and compare it with their own product price, Head of Product for Google Shopping Surojit Chatterjee announced at SMX Advanced in June. 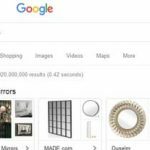 This feature follows Google’s updates to the feed creation process in 2017 and their launch of the Showcase Shopping ad format this year. the average price at which our competitors sell a product. as a percentage by how much their price differs from that of their competitors. as a colour gradient by how much their price differs from that of their competitors. Google aims to help advertisers better understand their competitors and more easily adjust their product bids when their competitors change their prices. see what their competitors’ prices are and use the information to decide how much to bid on specific products. see if competitors have changed their prices and use the information to update their bid strategy. However, as experts in Google Shopping management, we do not simply take Google for their word and have identified a potential limitation to the product price benchmarking feature. 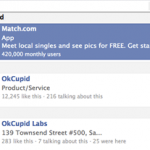 If this is the case, it will give advertisers a flawed understanding of their competitors. Let us explain in more detail what the benefit and limitation the new feature may have. We will be able to quickly see the average price at which our competitors sell a product as Google’s benchmark takes into consideration all the competitors in the ad auction. Whenever competitors change their prices, the change will be automatically factored into the benchmark, saving us the trouble of having to check the what the new prices are. This will be more efficient than looking at the auction insights of the ad group that contains the product and then checking the price at which each of the competitors in the auction sells the product on their respective websites. 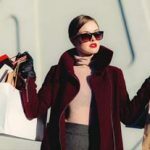 There is no indication whether Google will consider the visibility of the competitors and weigh the benchmark in favour of the competitors that are more visible in Google Shopping results. The prices of competitors that appear most frequently alongside us in the Google Shopping results should be more important than the prices of competitors that appear infrequently, as users will be more aware of competitors with greater visibility and base their perception of the average market price on the prices shown in the search results. If Google does not factor in the visibility of each competitor, it will mean that if there are many competitors with a small share of the Google Shopping results and they have low product prices, Google’s product price benchmark will be low, even if the few competitors that have a large share of the Google Shopping ad auction have high product prices. This will create the illusion that our product is not price-competitive in the Google Shopping results when from a user perspective it is. In conclusion, the feature helps us to see how price-competitive we are in comparison to those of our competitors who also advertise on Google Shopping, but we should conduct further analysis on the visibility of our competitors before adjusting our bids. 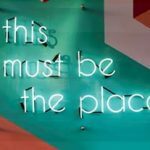 Follow my contributions to the blog to find out more about eCommerce PPC, or sign up to the ThoughtShift Guest List, our monthly email, to keep up-to-date on all our blogposts, guides and events. Pinky manages paid search advertising campaigns on the Google AdWords, Google Shopping, Bing Ads, and Bing Shopping platforms for B2B and B2C clients with lead generation and eCommerce goals.